The Land Rover Discovery or the Toyota Land Cruiser – which should you buy? Which is the best? Style is completely subjective and what I like might be completely different to what you like. In my opinion however, the Toyota Land Cruiser is better looking than the Land Rover Discovery. It looks meaner and more purposeful, sitting taller and slightly wider to command more road presence. The Discovery is still good looking though, in a more subtle way. The Land Rover Discovery is available with one engine – a 3.0-litre SDV6. The Toyota Land Cruiser is only available with one engine too – a 3.0-litre four-cylinder. The Toyota will return 34.9 miles per gallon combined and the Land Rover 35.3 mpg. In terms of performance, the Discovery will go from 0 – 60 in 8.8 seconds and the Land Cruiser 11 seconds. It needs to be well maintained and serviced (click here) to keep its optimum performance. The maximum towing capacity of the Toyota Land Cruiser is 3,000kg while for the Land Rover Discovery it’s 3,500kg. According to Farnell Land Rover, a Land Rover tow bar costs £510 and for a Land Cruiser £650. Both the Discovery and Land Cruiser are exceptional off-roaders. Each has a raft of electronics to boost off-road performance and both have adjustable air suspension, hill decent control, and low-range gearing options. Each also has rear and centre differential locks. Overall, both these cars as capable as each other off-road. The Discovery’s controls are a little easier to use than the Toyota’s, but on the limit, I suspect the Land Cruiser might be able to better the Discovery. Inside is where you’re going to spend all of your time so it’s important that the interior is of a good quality and all controls and switchgear are satisfying to use. The Discovery’s interior is a little dated now compared to a Range Rover, but it’s easily as good as the Toyota’s. Each car has an equal amount of luxury and cheap plastics and both share an excellent driving position. One area where the Land Cruiser blows the Discovery away is the third-row seats. The Toyota has an electrically folding row that’s a little more spacious and comfortable. For that reason, the Cruiser wins this round. 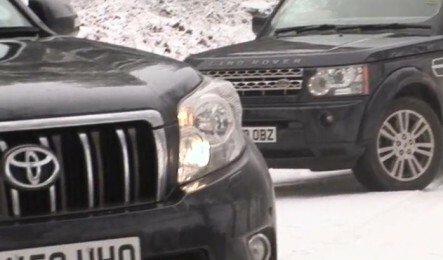 Both the Land Rover Discovery and Toyota Land Cruiser are capable off-roaders and family cars. Counting through our tests, the result of this match is a draw, with the Discovery benefiting from stronger engines and a higher towing capacity but the Land Cruiser fights back with more style and a better interior. You might also want to check out the reliability of both cars to see which has the most satisfaction as rated by users.